Mrs. Dixie L. Parton 74, a resident of Trenton, MO died Saturday, Jan. 26, 2019 at 3:16 A.M. at her home. Funeral services will be held Wednesday, Jan. 30, 2019 at 2:00 P.M. at Resthaven Mortuary, Trenton. Family visitation will be held Wednesday from 1:00 P.M. to 2:00 P.M. at the mortuary. Burial will be private at a later date at Resthaven Memorial Gardens. Memorial donations are suggested to the funeral home to help with costs. Mrs. Parton was born Oct. 16, 1944 in Kansas City, MO, the daughter of Carl and Alice Marie Timberlake Holsted. She had been employed at Northland Cathedral, Kansas City. On Sept. 16, 1965 she was married to Kenny Parton at Parkville, MO. He preceded her in death on March 8, 2016. Dixie enjoyed watching Jimmy Swaggart and old westerns and spending time with her dogs. 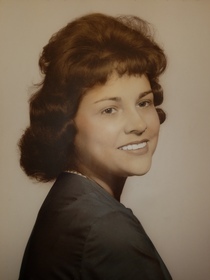 Her survivors include her triplet children Mitchell Parton, Michael Parton, both of Trenton and Michelle Akins, Lincoln, Nebraska, one sister Carla Strickland, Kansas City, MO, and one brother Floyd Holsted, Trenton, and eight grandchildren and four great grandchildren. She was preceded death by her parents, one sister Alberta Tomlin and one brother Lloyd Holsted.